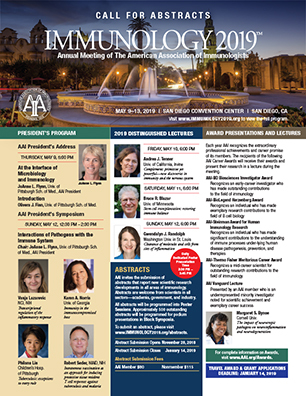 Traveling from Outside the U.S.
AAI invites attendees to submit abstracts of unpublished, original research for presentation at IMMUNOLOGY 2019™. All abstracts will be reviewed by committees of experts in their respective areas and scheduled for presentation. Outstanding regular abstracts submitted by January 14, 2019, will be selected for oral presentation in Block Symposia (oral presentations of abstract data). Posters are the most dynamic aspect of the AAI annual meeting! Meet abstract authors for face-to-face discussions and learn about their most recent research. Block Symposia are two-hour symposia consisting of short oral presentations of those abstracts that are deemed to be the best in each topic category. First authors have the option of requesting ‘Oral and Poster’ or ‘Poster Only’ when submitting their abstracts. Up to 40% of the submitted abstracts will be chosen to be presented in these symposia. All accepted abstracts, including those selected for oral presentation in a Block Symposium, are required to be presented as a poster. Posters are viewable for one day only. Posters are to be placed between 7:30 AM and 9:30 AM on the assigned day, on the assigned board. All first authors must be present at their poster between the hours of 2:30 PM and 3:45 PM on their assigned day. be present during their assigned poster session will forfeit publication of their abstract in the Supplement to The Journal of Immunology. Corresponding AAI travel awardees will, additionally, forfeit their award. Posters are to remain up until 3:45 PM and removed by 4:30 PM on the assigned day; posters not removed will be discarded. Videoing or photographing of posters without the permission of the author is forbidden. First authors are allowed to photograph their own posters. Note: No scientific sessions are scheduled during the Poster Session times! Immunosequencing opens a new window of discovery, revealing the breadth and depth of the immune repertoire in exquisite molecular detail. Mr. Sherry will share case studies illustrating discoveries inspired by this deeper view into the adaptive immune response. Join him and learn how the immunoSEQ Assay combines bias-controlled multiplex PCR with high-throughput sequencing and expert bioinformatics to deliver accurate, quantitative sequencing results for millions of T and B cell receptors. immunoSEQ Data has been published in more than 350 peer-reviewed papers. We will present the Maxpar® Direct™ Immune Profiling System, an exciting new product providing a sample-to-answer solution ideal for immune monitoring studies in clinical and translational research. The assay offers an efficient and reliable single-tube workflow for staining human PBMC or whole blood with a dry 30-marker panel of metal-labeled antibodies and a custom data collection template for the Helios™ mass cytometer. Data analysis with Maxpar Pathsetter™ software provides automated enumeration of 37 immune cell populations in as little as 5 minutes. We will describe the system and present data on repeatability, software precision and accuracy, and site-to-site reproducibility. The Amnis® CellStream® benchtop flow cytometry system from Luminex is a highly-customizable and compact flow cytometer that is the first to use a camera for detection. Its unique optics system and design provide researchers with unparalleled sensitivity and flexibility when analyzing cells and submicron particles. Only recently has the importance of extracellular vesicles as key mediators of intercellular communication been appreciated. Quantifying and characterizing extracellular vesicles in a reproducible and reliable manner has been difficult due to their small size (30-100 nm in diameter). Join us in this workshop to learn more about the unique Amnis time delay integration (TDI) and camera technology inside the CellStream® system, which facilitates the immunophenotyping of extracellular vesicles. Become a FlowJo™ master! Take your research wherever you go with our instrument-agnostic data analysis platforms that support flow cytometry and single cell sequencing data. Use our intuitive, drag-and-drop interface to seamlessly run your trailblazing analysis in or outside the lab. In this workshop, we will demonstrate typical analysis workflows as well as advanced data analysis capabilities in FlowJo, share tips and tricks to increase your productivity, and show you how to move past traditional gating with the latest and greatest advancements that computational biology has to offer. High-throughput single cell RNA sequencing (RNA-seq) has recently emerged as a powerful tool for profiling complex cell populations. While traditional RNA-seq captures information about transcript expression, recent technological advances using oligo-conjugated antibodies enable simultaneous detection of protein alongside RNA in high-throughput sequencing. This technology enables high-parameter protein analysis, and addition of protein information to RNA-seq data can provide better resolution of markers with low transcript abundance. This also enables more precise cell type identification and more intricate separation of cell types in a complex system. Ultimately, combining information from whole-transcriptome RNA-seq, targeted gene panels, and protein profiling (BD® AbSeq) can generate novel insights into single cell biology. Here, we discuss the interplay between single cell sequencing multi-omic data and other technologies, as well as how best to harness the information gained from high-parameter single cell sequencing data. Immudex introduced the first commercially available DNA barcoded MHC multimer technology, dCode™ Dextramers® in 2018. dCode Dextramers enable simultaneous detection of more than 1,000 T cell specificities in a single, small biological sample. Updated for 2019, 10x Genomics-compatible dCODE Dextramers combined with the Chromium Controller and 5’ feature barcode system-compatible dCODE Dextramers enable collection of gene expression, cell surface phenotype, and complete alpha/beta pair sequencing of each antigen-specific T cell. Data will be presented demonstrating the effectiveness of this workflow for simultaneous analysis of fifty antigen-specific T cell specificities from a single sample. The default conditions for immunologic assays include room air oxygen levels, which are not found in any tissue in vivo. Does it matter? We will discuss this fundamental question and tie in findings from the rapidly expanding field of immunometabolism, including CAR-T cell, NK cell, macrophage, and B cell data. We will also discuss recent advances in eliminating edge effect from ninety-six-well plates. Attendees will gain insight into critical issues for scientific accuracy, reproducibility, and translatability. CODEX® technology enables users to image more than forty biomarkers using a simple benchtop platform that integrates with existing fluorescence microscopes. The platform is compatible with cell suspensions and FFPE and fresh frozen tissues. Akoya Biosciences has an exclusive license to commercialize CODEX® technology, which was developed in the laboratory of Dr. Garry Nolan at Stanford University. In October 2018, Akoya Biosciences acquired the Quantitative Pathology Solutions business of PerkinElmer, which includes the Vectra Polaris and Opal staining kits for high-throughput multiplexed immunofluorescence. The combination of high multiplexing capabilities of CODEX® and high-throughput analysis with Phenoptics™ enables researchers to go from biomarker discovery to validation with a single partner. In this workshop, we will present the latest enhancements to the CODEX® and Phenoptics™ platforms and their applications in immunology and immuno-oncology. Paul G. Thomas, Ph.D., Faculty Member, St. Jude Children’s Res. Hosp. Recent advancements from 10x Genomics allow the integration of simultaneous cell-surface protein, transcriptome, immune repertoire, and antigen specificity measurements at single cell resolution, providing a comprehensive characterization of immune cells. In this workshop, we will demonstrate a scalable method for deciphering TCR–pMHC specificity combined with cellular phenotype. Attendees will also hear from researchers about how they are using this groundbreaking technology to unlock cell repertoires and understand T cell specificity in tumors vs. healthy tissues using single cell multi-omic analysis. The enrichment and isolation of leukocyte populations is critical to advancing research, and benchtop cell separation has become an important part of many researchers’ daily workflow. In recent years, there has been a growing need for an alternative to immunomagnetic methods. Akadeum is introducing that alternative in our new microbubble technology. This workshop will present an overview of our microbubble technology and its use in the following: the isolation of mouse B cells, red blood cell cleanup of flow sorting samples, and an improved method for NK cell isolation. In some cancer types, the presence of tumor-infiltrating lymphocytes (TILs) predicts the response to chemotherapy. However, more work is needed to better understand the composition and functional state of TILs across cancer types and design more effective immunotherapeutic strategies. Dr. Colt Egelston and colleagues from Dr. Peter Lee’s laboratory previously demonstrated that CD8+ TILs in many breast cancer samples retained polyfunctionality despite expressing PD-1, a marker of T cell exhaustion. In this workshop, Dr. Egelston will discuss recent efforts to isolate and characterize phenotypically and functionally exhausted CD8+ TILs from a subset of breast tumors. His work suggests that some patients have inflamed tumors infiltrated by exhausted CD8+ TILs and that these patients may benefit from immunotherapeutic intervention. STEMCELL scientists will discuss other applications and cell types with which EasySep™ cell separation technology can be used to accelerate cancer research. Immune cell function is governed by an intricate network of cellular signals, environment, and metabolism. However, many cellular assays are limited to snapshot-in-time techniques that focus on the characterization of the cells rather than the pathways involved in reaching that endpoint. Agilent Seahorse XF technology is enabling the shift to real-time quantification of immune cell function, opening a new window on controlling cell fate. This workshop will discuss new approaches to quantifying immune cell function as well as the metabolic mechanisms that underlie this function. Immunotherapy is proving to be an effective therapeutic approach in a variety of advanced and metastatic cancers. While Tumor Mutational Burden has been recently validated as a clinical biomarker in response to Immune Checkpoint Inhibitors, it’s only predictive in a subset of cases. New potential biomarkers like TCR clonality can further augment immune therapy success. This workshop highlights and introduces an emerging liquid biopsy biomarker for the development of future immunotherapies using TCR sequencing and describes how this new potential biomarker may expand our understanding of the tumor immunity cycle. Recent advances in single cell analysis and instruments, in parallel with next-generation sequencing, have enabled the generation of transcriptomic data in a high-throughput fashion, propelling the field of single cell RNA sequencing (scRNA-seq). However, despite the analytical power of scRNA-seq, important hallmarks of immune cell states, phenotype, and other cellular processes that heavily rely on protein expression are often not detected in scRNA-seq. In this workshop, we will describe recent developments in the use of TotalSeq™ oligo-antibody conjugates as these reagents integrate seamlessly into workflows that combine scRNA-seq and protein analysis, such as CITE-seq and REAP-seq. We will illustrate how some flow cytometry experimental complexity can be simplified with the use of these reagents, reducing the number of populations that need to be sorted before single cell analysis. In addition, we will show the use of cell hashing reagents, which enable sample multiplexing, resulting in reduced variability, lower cost, and optimization of single cell instrument and reagents use. Hashing antibodies can also be applied to nuclei, not just single cell suspensions, for cells that are difficult to isolate. With the development of the TotalSeq™ reagent suite, we hope to facilitate the next wave of legendary discovery in biomedical research. We created workflows that unite multiparameter image analysis using our brand-new MACSima™ imaging platform, tumor dissociation, magnetic isolation, flow sorting analysis, and cell culture. Combining these techniques allows maximizing the information obtained while retaining cells for functional usage even using very small and hard-to-obtain patient tumor samples. Understanding signaling pathways is crucial to developing therapies that maximize efficacy and minimize toxicity. This workshop focuses on how MS-based proteomics and intracellular flow cytometry can further our understanding of immune regulation in cancer and improve therapeutic potentials. Our proteomics methodology, using antibodies that enable focused analysis of regulatory PTMs, and phospho-flow cytometry allow identification of rare signaling events during co-stimulation or inhibition of checkpoints. This workshop will show how small protocol changes can overcome many of the challenges of proteomic analysis and combined extra- and intracellular flow cytometry. The accuracy of multicolor flow cytometry is improved by eliminating dead cells from the analysis. Dead cells bind antibodies nonspecifically and also tend to have increased autofluorescence. Completely eliminating them by forward and side scatter is difficult because dying cells can maintain their physical structure at the beginning of the process. All commercially available fixable viability dyes are based on NHS ester compounds that crosslink with primary amines on proteins. This chemistry is susceptible to hydrolysis, decreasing the reagent stability, and ease of use. ViaKrome Fixable Viability Dyes are a new thiol reactive fluorescent dye that is soluble in aqueous buffer, does not require DMSO for reconstitution, and exhibits bright staining in whole blood samples. They are offered in a range of colors: ViaKrome 405, ViaKrome 561, ViaKrome 638, and ViaKrome 808. This choice provides flexibility for multicolor panel design. The compatibility of the ViaKrome dyes will be presented in eighteen-color immunphenotyping panels and functional assays using PBMCs and whole blood. For research use only. Not for use in diagnostic procedures. Peptide microarrays offer a wide range of applications, including linear and conformational epitope mapping, autoantibody discovery, and the analysis of humoral immune responses upon infection or cancer development. PEPperPRINT offers custom-made peptide microarrays and analysis services based on its unique amino acid-laser-printing method. During our workshop, we will give a short introduction to the PEPperPRINT technology, followed by a scientific presentation by Dr. John D. Mountz. Dr. Mountz used high-throughput epitope mapping analysis to identify autoantigen epitopes targeted in systemic lupus erythematosus patients who exhibited B cell autocrine interferon beta expression and developed renal disease. Let’s get ready to immunophenotype! Panel building usually requires many steps for optimal experimental design. In this session, learn the five steps for building a quick and easy experiment to find your immune cell subsets. Then get ready to battle it out with other researchers for a skill set victory. The Cytek™ Aurora flow cytometer has made more than twenty-four color flow cytometry panels possible with only three lasers. The spectral overlap of traditional fluorophores previously limited panel design. With spectral unmixing, fluorophores may occupy the same emission peak if each has its own distinct spectral fingerprint. This new generation of instruments also use photodiode detectors instead of traditional PMTs and are sensitive up to 1000nm, making it now possible to detect novel near-infrared emitting fluorophores. This talk covers spectral unmixing, informed panel development, and a twenty-four-color immunophenotyping panel implementing some novel fluorophores developed by BioLegend, specifically useful for this new generation of flow cytometers. CRISPR technology has revolutionized stem cell biology research in recent years, but applying it in primary immune cells has proved challenging. In this workshop, Dr. Shifrut will present a novel pooled CRISPR screening technology developed in Dr. Alexander Marson’s lab. The Marson lab is interested in using CRISPR technology to prioritize novel targets for cancer immunotherapy drug development and to improve the design of genetically reprogrammed cell-based therapies. Using this new method, known as sgRNA lentiviral infection with Cas9 protein electroporation (SLICE), the lab identified key regulators of primary human T cell function. Targeted ablation of individual candidate genes characterized hits and identified perturbations that enhanced cancer cell killing. These results highlight the potential of SLICE to explore unmapped genetic circuits in primary cells and to guide the design of engineered cell therapies. STEMCELL scientists will also discuss other CRISPR applications. Olink’s Proximity Extension Assay (PEA) technology uses pairs of oligo-linked antibodies for a dual-recognition, analog-to-digital readout that enables exceptional specificity in a high-multiplex immunoassay format. The workshop will discuss how Olink’s protein biomarker panels are impacting the immunology field. The complexity of the immune system may require a systematic approach looking at many different cell types and their interplay with a wide range of different proteins. The potential diversity among individuals means that many samples may need to be analyzed. Examples of such approaches that provide crucial insights into complex immune system questions will be presented. Ryan Duggan is currently a senior scientist in Oncology Discovery & Cytometry at AbbVie, Inc., in North Chicago, Illinois. Mr. Duggan, the former cytometry core director at University of Chicago, is also a key opinion leader in the field of flow cytometry. He will share how he evaluates flow cytometers and has selected the NovoCyte Quanteon (four lasers, twenty-five fluorochrome detection channels) specifically to share his evaluation of this instrument’s capability, performance, and usability. Further discussion will include how a powerful flow cytometer can be used for cell analysis in research labs as well as in the work flow of cell analysis for therapeutic discoveries in an industrial setting. This talk will help researchers understand practical methods for identifying the most appropriate flow cytometer for their needs among the various options in the current market. Additionally, it will demonstrate the utility of such an instrument in facilitating research and development of novel therapeutics by understanding the tumor microenvironment at the single cell level. Explore the IEDB, a free online resource funded by NIAID, designed to catalog and analyze immune epitope-related data. Participants will learn how to search and predict epitopes from specific pathogens, allergens or auto-antigens recognized by T cells or antibodies in various disease settings and resulting in different immune outcomes. This is an ideal opportunity for new users of the IEDB to be introduced to the program or for experienced users to advance their understanding of how the IEDB can answer their research questions. A laptop to follow along with the presentation is highly recommended. Immune cells pose unique challenges for live-cell imaging due to their often mobile and non-adherent nature, moving away from the field of view with even slight changes to the culture, often necessitating the use of surface coating to artificially immobilize them. Find out how to image and track immune cell behavior, hypoxic responses, migration and aggregation for days by restricting field of view with unique cell-trap technology while maintaining precise, computer programmed control of key culture parameters (reagents, temp, gas mixture) using the CellASIC® ONIX2 microfluidic platform. This highly controllable culture environment is equipped with recently introduced “cell trap” technology that allows high resolution imaging of dynamic cells using standard inverted microscopes. Branded charging units will be located in the scientific session meeting rooms for use by attendees. Session rooms hold between 75 -600 attendees and continue for four days. 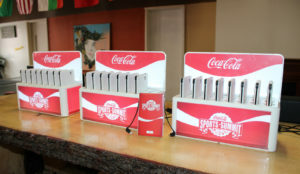 Each branding unit has 8 individual portable power packs to fast charge attendee phones. Sponsorship includes branding of the charging unit and the individual power packs. This popular opportunity is available in two rooms in the Exhibit Hall. With theater-style seating for up to 100 attendees, each room provides the perfect setting for in-depth presentations and discussion. Workshops do not conflict with daily dedicated poster presentation time. Presentation titles, speakers, and descriptions must be provided by the date requested by AAI. Note: The one-hour room rental includes time for your set-up, 45-minute presentation, and tear-down. There is one main escalator which takes attendees from the street level Registration Lobby and Exhibit Hall Entrance to the scientific sessions. There are branding opportunities for the insides of the escalators and also the areas between the escalators. Contact AAI Exhibits for further information. The San Diego Convention Center offers sponsors great options for banner placement in high traffic areas. NEW for 2019, there are opportunities for banners near the scientific sessions. Sizes and locations vary. Contact AAI Exhibits to see which banner options fit your company’s needs. NEW! Six single-column sponsorships are available directly outside of the scientific sessions, and four double-column sponsorships are available in the area of Registration and the Exhibit Hall Entrance. Each sponsorship includes full wrap of the column(s) with your branding and artwork. Provide one or more park benches for attendees to rest in the Exhibit Hall. Sponsorship includes a 48″ x 24″ floor graphic in front of the park bench. Park benches will be located on a main exhibit aisle in sets of two, back to back. These four-sided, spinning, lighted kiosks will be located in the area of Registration and the Exhibit Hall Entrance. Sponsors have the option for different graphics on each of the 4 panels. Each panel is 39″ x 89″. Display your logo and booth number on a 4′ x 3′ aisle sign in the Exhibit Hall. Place your promotional material or item directly into all attendees’ hands for long-term residual exposure. Sponsor arranges the purchase, production, and delivery of at least 3,500 items. Limitations on size apply and items must be submitted to AAI for approval 30 days prior to the meeting. Examples of acceptable inserts are promotional brochures, postcards, and other printed materials (no catalogs or publications) and items such as pens, USB flash drives, luggage tags, etc. Immediately following the President’s Address, this best attended social event of the week provides attendees a festive opportunity to be reunited with friends (2,000+ attendees). Co-sponsors receive access for five staff members (this event is closed to all exhibitors except sponsors), a display table, and a complimentary pre-show mailing list. * This event is capped at ten co-sponsors. To inquire about exclusive (at cost) sponsorship of this event, contact AAI Exhibits Manager at exhibits@aai.org or 301-634-7821. * AAI policy prohibits provision of e-mail addresses to third parties. Mailing lists exclude residents of the European Union (EU) pursuant to the EU General Data Protection Regulation (GDPR) at EUGDPR.org. See attendees carrying your logo throughout the meeting. AAI will arrange for production and delivery of bags. Exclusive sponsorship available with just your logo, or shared sponsorship will have your company logo and another company’s logo on the bag. Price includes one-color logo. Attendees will display your company logo on their lanyards. Sponsor arranges for production and delivery of at least 4,000 AAI-approved lanyards. Reach attendees numerous times daily with exclusive sponsorship of hotel key cards. Your company branding will be printed on the room key provided to attendees staying in the AAI hotel block. Logo and graphics must be submitted to AAI for approval no later than February 15, 2019; AAI will arrange for production and delivery of hotel key cards. The meeting app provides the most up to date meeting program and was downloaded over 3,000 times by IMMUNOLOGY 2018TM participants. Rotating banner sponsors receive a clickable rotating banner ad with secondary landing page. The meeting app provides the most up to date meeting program and was downloaded over 3,000 times by IMMUNOLOGY 2018™ participants. Elite sponsor will have a secondary splash page plus a clickable rotating banner ad with secondary landing page. Drive traffic to your booth! Provided to each attendee at Registration, the Passport will feature your booth on the Exhibit Hall floor plan map. Attendees enter their completed Passports in the drawing for one of three $250 American Express Gift cards. The drawing will take place during the Poster Presentation Hour on Sunday. This program is limited to exhibitors with 200 square feet or less of booth space. Let attendees know why they need to visit your booth and meet with you. The list will be provided electronically prior to the meeting, with physical mailing addresses only (no phone, fax, or email), and is for one-time use only. Reinforce your message with a post-event mailing. The list will be provided electronically after the meeting, with physical mailing addresses only (no phone, fax, or email), and is for one-time use only. Through lectures, workshops, roundtables, and one-on-one counseling, IMMUNOLOGY 2019™ provides critical career development programs. Sponsor pricing varies with the size of the event and the nature of food and beverage served. Support these programs to support the PIs of tomorrow! AAI provides much-needed travel grant support for early-career faculty and trainees who might not otherwise be able to attend the meeting. These grants provide travel support to mid-career investigators for attending the AAI annual meeting. The grants are awarded to scientists who have limited funds for travel and are the first or last authors on one or more abstracts submitted to the annual meeting. Each grant will provide two travel awards of up to $1,250 each: one to the PI or laboratory director and another to a member of his or her lab. These grants assist undergraduate faculty attending the AAI annual meeting. The grants also support travel costs for an undergraduate student of the recipient’s selection. These awards provide critical travel support for AAI Trainee Members whose first-author abstracts are selected for oral presentation in an AAI Block Symposium. Over 300 abstract awards are given to our most talented developing investigators. These awards provide up to $300 in travel reimbursement to AAI Trainee Members whose first-author abstracts selected exclusively for poster presentation are deemed to be exceptional. Selection is based on the originality and significance of the research presented. Approximately 100 poster awards will be given to talented early-career investigators.